Vitreous enamel, also called porcelain enamel, is a material made by fusing powdered glass to a substrate by firing, usually between 750 and 850 °C (1,380 and 1,560 °F). The powder melts, flows, and then hardens to a smooth, durable vitreous coating. The word comes from the Latin vitreum, meaning "glassy". Enamel can be used on metal, glass, ceramics, stone, or any material that will withstand the fusing temperature. In technical terms fired enamelware is an integrated layered composite of glass and another material (or more glass). The term "enamel" is most often restricted to work on metal, which is the subject of this article. Enamelled glass is also called "painted", and overglaze decoration to pottery is often called enamelling. Enamelling is an old and widely adopted technology, for most of its history mainly used in jewelry and decorative art. Since the 19th century, enamels have also been applied to many consumer objects, such as some cooking vessels, steel sinks, enamel bathtubs, and stone countertops. It has also been used on some appliances, such as dishwashers, laundry machines, and refrigerators, and on marker boards and signage. The term "enamel" has also sometimes been applied to industrial materials other than vitreous enamel, such as "enamel" paint and the polymers coating "enamelled" wire. The word enamel comes from the Old High German word smelzan (to smelt) via the Old French esmail, or from a Latin word smaltum, first found in a 9th-century life of Leo IV. Used as a noun, "an enamel" is usually a small decorative object coated with enamel. "Enamelled" and "enamelling" are the preferred spellings in British English, while "enameled" and "enameling" are preferred in American English. The ancient Egyptians applied enamels to stone objects, pottery, and sometimes jewellery, although to the last less often than in contemporaneous cultures in the Near East. The ancient Greeks, Celts, Georgians, and Chinese also used enamel on metal objects. Enamel was also used to decorate glass vessels during the Roman period, and there is evidence of this as early as the late Republican and early Imperial periods in the Levant, Egypt, Britain and around the Black Sea. 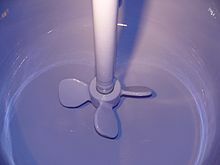 Enamel powder could be produced in two ways, either by powdering coloured glass, or by mixing colourless glass powder with pigments such as a metallic oxide. Designs were either painted freehand or over the top of outline incisions, and the technique probably originated in metalworking. Once painted, enamelled glass vessels needed to be fired at a temperature high enough to melt the applied powder, but low enough that the vessel itself was not melted. Production is thought to have come to a peak in the Claudian period and persisted for some three hundred years, though archaeological evidence for this technique is limited to some forty vessels or vessel fragments. Ancient Persians used this method for colouring and ornamenting the surface of metals by fusing over it brilliant colours that are decorated in an intricate design and called it Meenakari. The French traveller, Jean Chardin, who toured Iran during the Safavid reign, made a reference to an enamel work of Isfahan, which comprised a pattern of birds and animals on a floral background in light blue, green, yellow and red. Gold has been used traditionally for Meenakari Jewellery as it holds the enamel better, lasts longer and its lustre brings out the colours of the enamels. Silver, a later introduction, is used for artifacts like boxes, bowls, spoons, and art pieces while copper which is used for handicraft products was introduced only after the Gold Control Act, which compelled the Meenakars to look for a material other than gold, was enforced in India. Initially, the work of Meenakari often went unnoticed as this art was traditionally used as a backing for the famous kundan or stone-studded jewellery. This also allowed the wearer to reverse the jewellery as also promised a special joy in the secret of the hidden design. In European art history, enamel was at its most important in the Middle Ages, beginning with the Late Romans and then the Byzantine, who began to use cloisonné enamel in imitation of cloisonné inlays of precious stones. The Byzantine enamel style was widely adopted by the "barbarian" peoples of Migration Period northern Europe. The Byzantines then began to use cloisonné more freely to create images; this was also copied in Western Europe. The champlevé technique was considerably easier and very widely practiced in the Romanesque period. In Gothic art the finest work is in basse-taille and ronde-bosse techniques, but cheaper champlevé works continued to be produced in large numbers for a wider market. 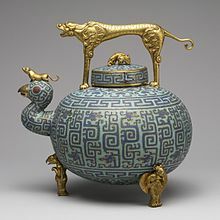 From either Byzantium or the Islamic world, the cloisonné technique reached China in the 13–14th centuries. The first written reference to cloisonné is in a book from 1388, where it is called "Dashi ('Muslim') ware". No Chinese pieces that are clearly from the 14th century are known; the earliest datable pieces are from the reign of the Xuande Emperor (1425–35), which, since they show a full use of Chinese styles, suggest considerable experience in the technique. Cloisonné remained very popular in China until the 19th century and is still produced today. The most elaborate and most highly valued Chinese pieces are from the early Ming Dynasty, especially the reigns of the Xuande Emperor and Jingtai Emperor (1450–57), although 19th century or modern pieces are far more common. Starting from the mid-19th century, the Japanese also produced large quantities of very high technical quality. More recently, the bright, jewel-like colors have made enamel a favoured choice for jewellery designers, including the Art Nouveau jewellers, for designers of bibelots such as the eggs of Peter Carl Fabergé and the enameled copper boxes of the Battersea enamellers, and for artists such as George Stubbs and other painters of portrait miniatures. A resurgence in enamel-based art took place near the end of the 20th century in the Soviet Union, led by artists like Alexei Maximov and Leonid Efros. In Australia, abstract artist Bernard Hesling brought the style into prominence with his variously sized steel plates. Enamel was first applied commercially to sheet iron and steel in Austria and Germany in about 1850. Industrialization increased as the purity of raw materials increased and costs decreased. The wet application process started with the discovery of the use of clay to suspend frit in water. Developments that followed during the 20th century include enamelling-grade steel, cleaned-only surface preparation, automation, and ongoing improvements in efficiency, performance, and quality. Vitreous enamel can be applied to most metals. Most modern industrial enamel is applied to steel in which the carbon content is controlled to prevent unwanted reactions at the firing temperatures. Enamel can also be applied to gold, silver, copper, aluminium, stainless steel, and cast iron. Vitreous enamel has many useful properties: it is smooth, hard, chemically resistant, durable, scratch resistant (5–6 on the Mohs scale), has long-lasting colour fastness, is easy to clean, and cannot burn. Enamel is glass, not paint, so it does not fade under ultraviolet light. A disadvantage of enamel is a tendency to crack or shatter when the substrate is stressed or bent, but modern enamels are relatively chip- and impact-resistant because of good thickness control and coefficients of thermal expansion well-matched to the metal. The Buick automobile company was founded by David Dunbar Buick with wealth earned by his development of improved enamelling processes, c. 1887, for sheet steel and cast iron. Such enameled ferrous material had, and still has, many applications: early 20th century and some modern advertising signs, interior oven walls, cooking pots, housing and interior walls of major kitchen appliances, housing and drums of clothes washers and dryers, sinks and cast iron bathtubs, farm storage silos, and processing equipment such as chemical reactors and pharmaceutical process tanks. Structures such as filling stations, bus stations and Lustron Houses had walls, ceilings and structural elements made of enamelled steel. One of the most widespread modern uses of enamel is in the production of quality chalk-boards and marker-boards (typically called 'blackboards' or 'whiteboards') where the resistance of enamel to wear and chemicals ensures that 'ghosting', or unerasable marks, do not occur, as happens with polymer boards. Since standard enamelling steel is magnetically attractive, it may also be used for magnet boards. Some new developments in the last ten years include enamel/non-stick hybrid coatings, sol-gel functional top-coats for enamels, enamels with a metallic appearance, and easy-to-clean enamels. The key ingredient of vitreous enamel is finely ground glass called frit. Frit for enamelling steel is typically an alkali borosilicate glass with a thermal expansion and glass temperature suitable for coating steel. Raw materials are smelted together between 2,100 and 2,650 °F (1,150 and 1,450 °C) into a liquid glass that is directed out of the furnace and thermal shocked with either water or steel rollers into frit. Colour in enamel is obtained by the addition of various minerals, often metal oxides cobalt, praseodymium, iron, or neodymium. The latter creates delicate shades ranging from pure violet through wine-red and warm grey. Enamel can be transparent, opaque or opalescent (translucent). Different enamel colours can be mixed to make a new colour, in the manner of paint. There are various types of frit, which may be applied in sequence. A ground coat is applied first; it usually contains smelted-in transition metal oxides such as cobalt, nickel, copper, manganese, and iron that facilitate adhesion to the metal. Next, clear and semi-opaque frits that contain material for producing colours are applied. Basse-taille, from the French word meaning "low-cut". The surface of the metal is decorated with a low relief design which can be seen through translucent and transparent enamels. The 14th century Royal Gold Cup is an outstanding example. Grisaille, French term meaning "in grey", where a dark, often blue or black background is applied, then a palescent (translucent) enamel is painted on top, building up designs in a monochrome gradient, paler as the thickness of the layer of light colour increases. Champlevé, French for "raised field", where the surface is carved out to form pits in which enamel is fired, leaving the original metal exposed; the Romanesque Stavelot Triptych is an example. Cloisonné, French for "cell", where thin wires are applied to form raised barriers, which contain different areas of (subsequently applied) enamel. Widely practiced in Europe, the Middle East and East Asia. Plique-à-jour, French for "open to daylight" where the enamel is applied in cells, similar to cloisonné, but with no backing, so light can shine through the transparent or translucent enamel. It has a stained-glass like appearance; the Mérode Cup is the surviving medieval example. Ronde bosse, French for "in the round", also known as "encrusted enamel". A 3D type of enamelling where a sculptural form or wire framework is completely or partly enamelled, as in the 15th century Holy Thorn Reliquary. En résille (Émail en résille sur verre, French for 'enamel in a network on glass,') where enamelled metal is suspended in glass. The technique was briefly popular in seventeenth-century France and was re-discovered by Margret Craver in 1953. Craver spent 13 years re-creating the technique. Enamelled glass, in which a glass surface is enamelled, and fired to fuse the glasses. Painted enamel, a design in enamel is painted onto a smooth metal surface. Grisaille and later Limoges enamel are types of painted enamel. Most traditional painting on glass, and some on ceramics, uses what is technically enamel, but is often described by terms such as "painted in enamels", reserving "painted enamel" and "enamel" as a term for the whole object for works with a metal base. Stenciling, where a stencil is placed over the work and the powdered enamel is sifted over the top. The stencil is removed before firing, the enamel staying in a pattern, slightly raised. Sgraffito, where an unfired layer of enamel is applied over a previously fired layer of enamel of a contrasting colour, and then partly removed with a tool to create the design. Serigraph, where a silkscreen is used with 60-70in grade mesh. Counter enamelling, not strictly a technique, but a necessary step in many techniques, is to apply enamel to the back of a piece as well – sandwiching the metal – to create less tension on the glass so it does not crack. Limoges enamel, made at Limoges, France, a famous center of vitreous enamel production. Limoges became famous for champlevé enamels from the 12th century onwards, producing on a large scale, and then from the 15th century retained its lead by switching to painted enamel on flat metal plaques. On sheet steel, a ground coat layer is applied to create adhesion. The only surface preparation required for modern ground coats is degreasing of the steel with a mildly alkaline solution. White and coloured second "cover" coats of enamel are applied over the fired ground coat. For electrostatic enamels, the coloured enamel powder can be applied directly over a thin unfired ground coat "base coat" layer that is co-fired with the cover coat in a very efficient two-coat/one-fire process. 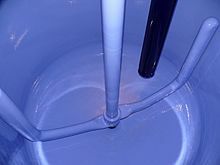 The frit in the ground coat contains smelted-in cobalt and/or nickel oxide as well as other transition metal oxides to catalyse the enamel-steel bonding reactions. During firing of the enamel at between 760 to 895 °C (1,400 to 1,643 °F), iron oxide scale first forms on the steel. The molten enamel dissolves the iron oxide and precipitates cobalt and nickel. The iron acts as the anode in an electrogalvanic reaction in which the iron is again oxidised, dissolved by the glass, and oxidised again with the available cobalt and nickel limiting the reaction. Finally, the surface becomes roughened with the glass anchored into the holes. The Royal Gold Cup with basse-taille enamels; weight 1.935 kg, British Museum. Saint Agnes appears to her friends in a vision. Early 13th century Limoges chasse used to hold holy oils; most were reliquaries. ^ "Remodeling 101: 6 Considerations For Lava Stone Countertops – Remodelista". remodelista.com. 15 December 2016. Chisholm, Hugh, ed. (1911). "Enamel" . Encyclopædia Britannica (11th ed.). Cambridge University Press. ^ Andrews, A.I. Porcelain Enamels, The Garrard Press: Champaign, IL, 1961 p. 1. ^ a b c d Rutti, B., Early Enamelled Glass, in Roman Glass: two centuries of art and invention, M. Newby and K. Painter, Editors. 1991, Society of Antiquaries of London: London. ^ "The Art of Minakari". iranreview.org. ^ "Japanese Cloisonné: the Seven Treasures". Victoria and Albert Museum. Archived from the original on 2009-02-23. Retrieved 2009-08-30. ^ "What is Vitreous Enamel?". vea.org.uk. ^ database and e-research tool for art and design researchers. "Bernard Hesling :: biography at :: at Design and Art Australia Online". Daao.org.au. Retrieved 2013-12-25. ^ Andrews, A.I. Porcelain Enamels, The Garrard Press: Champaign, IL, 1961 p. 5. ^ Judd, Donald, “Porcelain Enameling Aluminum: An Overview,” Proceedings of the 59th Porcelain Enamel Institute Technical Forum, 45-51 (1997). ^ Sullivan, J.D. and Nelson, F.W., "Stainless Steel Requires Special Enameling Procedures", Proceedings of the Porcelain Enamel Institute Technical Forum," 150-155 (1970). ^ Pew, Steve, "The Who, What, Why, Where, and When of Cast Iron Enameling," Advances in Porcelain Enamel Technology, 177-186, (2010). ^ Fedak, David and Baldwin, Charles, "A Comparison of Enameled and Stainless Steel Surfaces," Proceedings of the 67th Porcelain Enamel Institute Technical Forum, 45-54 (2005). ^ Gavlenski, Jim and Baldwin, Charles, "Advanced Porcelain Enamel Coatings with Novel Properties," Proceedings of the 69th Porcelain Enamel Institute Technical Forum, 53-58, (2007). ^ Andrews, A.I. Porcelain Enamels, The Garrard Press: Champaign, IL, 1961 p. 321-2. ^ "Craft: Jewelry: Brooch". Luce Foundation Center for American Art. Smithsonian American Art Museum. Archived from the original on 13 July 2009. Retrieved 29 March 2013. ^ British Museum collection database, "Scope note" for the term "enamelled"; other sources use different categories. ^ Vitreous and porcelain enamels — Characteristics of enamel coatings applied to steel panels intended for architecture. Standards Policy and Strategy Committee. 2008. ISBN 978 0 580 72284 4. "Collection Highlights: Art in the Islamic World". Beaker. Smithsonian Institution: 2013. Dimand, M. S. "An Enameled-Glass Bottle of the Mamluk Period". Metropolitan Museum of Art. Maryon, Herbert (1971). "Enamelling". Metalwork and Enamelling (5th ed.). New York: Dover. ISBN 0-486-22702-2. Papadopoulous, Kiko. "Venetian Eastern Trade: 11th to 14th Centuries" 20 January 2012. Wikimedia Commons has media related to Enamel.